Recently, I've had a few opportunities to use my iPad 2 for presentations. 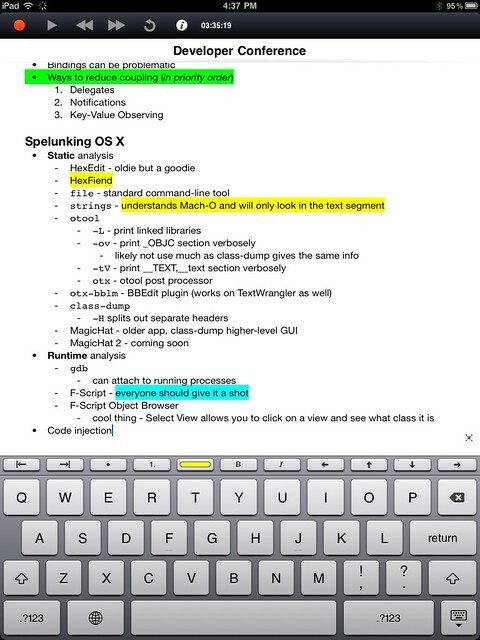 It worked so well, I've captured my thoughts for anyone else thinking about presenting with an iPad 2. One flaw in the original iPad were limitations when using the Apple VGA Adapter. The adapter only worked in certain apps, like Keynote and no others by default. Pretty useless for showing websites or iPad apps that didn't support video out. The iPad 2 changes this by mirroring the entire iPad screen through an adapter to a TV screen or overhead projector. It doesn't matter which app you're in — mirroring works in any app you care to launch. It even shows the iPad desktop. 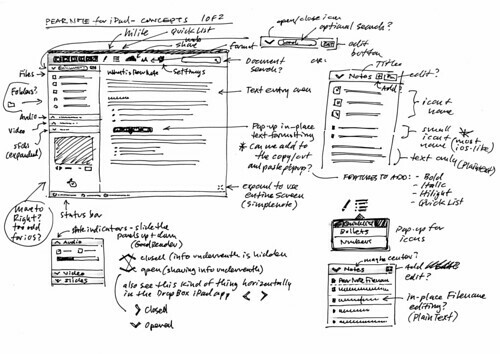 Through mirroring, I can blend sketchnotes right into my presentations. Using Adobe Ideas, Penultimate or Sketchbook Pro to draw on the iPad screen, my audience can see those drawings as they happen on the big screen, in real time. 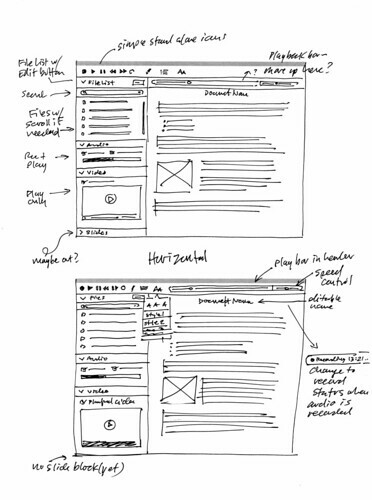 Images, like wireframes or design mockups can be imported into a drawing tool, and notes can be added right on top of the images. This could be ideal for design critique sessions, as feedback could be captured from a team, with one facilitator or even each team member making notes directly on the design for all to see. iPad 2 screen mirroring also opens the door for other collaborative apps being used on the iPad - writing tools, task and project management tools and more. In a visual thinking workshop this week with Stone Ward, we used Air Sketch, an iPad app to draw sketchnotes, which were displayed locally on my MacBook's web browser over WiFi from the little web server built into the app. The images posted after a very brief delay, which was so brief the remote watchers couldn't sense it. 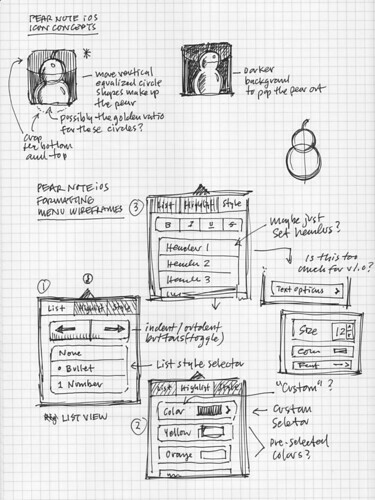 A sketch sent from the Air Sketch web server in a local browser window. This approach worked great. Images Air Sketch displayed live in the browser were shared with a remote audience over a GoToMeeting connection, who could see and respond to my live drawings almost immediately. I'm excited to see what other drawing tools will develop in this space, with presentations to local and remote audiences in mind. 1. The Apple VGA Adapter ($29) with a 30 pin adapter on one end and a VGA port on the other. The VGA adapter is probably better for all around use, as you're more likely to find a VGA cable on an overhead projector when presenting on the road. 2. Apple Digital AV Adapter ($39) with HDMI port and a 30-pin connector to charge the iPad. This adapter requires an HDMI cable and port on the overhead projector or HDTV monitor. Having the charger might also be handy, though a fully charged iPad 2 ought to run a good 8-10 hours on a charge. 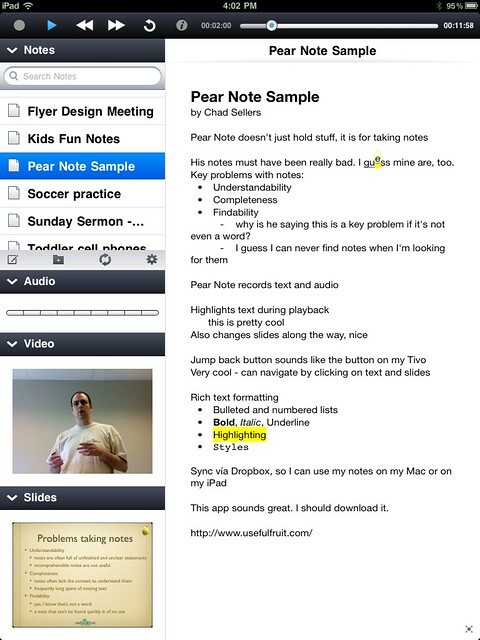 If you have an iPad 2, try picking up one of the Apple video adapters so you can try it out in your next presentation. It might just become your go-to presentation device. Last spring I purchased an original iPad and had a few observations about choosing a 3G iPad over a WiFi iPad. I thought these observations after a year of use might be helpful for you, if you're looking at the new iPad 2 (launching today) and are weighing 3G vs. WiFi networking as part of your purchase. So, below are some thoughts about why you might choose a 3G iPad 2 or a WiFi iPad 2—maybe a few things you hadn't considered about them on the surface. • GPS Unit - (WiFi doesn't) so that maps and other location services work better, even if you decide to cancel the 3G plan after the first month. • Easy Re-Activation - Even if you eventually turn off 3G, it's easy to activate it on the spot, right on the iPad if you need connectivity. I needed this once and it was very convenient to have immediate access as needed. • Equal AT&T and Verizon Plans - After reading the Apple Insider article on 3G options, both Verizon and AT&T plans are pretty close and let you turn them on and off at will. The article was updated to show no Verizon $35 activation fee at startup, or later on. • Activation Really is On-Demand - I believe (based on our 3G iPad 1) we had to at least activate the first month, then we were free to cancel or activate at will afterwards. It worked really well for us—we ran AT&T 3G for our summer vacation, then turned off 3G for a few months, re-activating it a few times as needed later in the year. • 3G is Great on the Road - Having 3G on the road was nice for maps. My wife did hotel research one stormy day while I was driving us home—3G was well worth having. • Free WiFi on AT&T - If you go AT&T you also get access to AT&T's WiFi hotspots, which might be handy at Starbucks ands other locations where those hotspots appear. • 250MB 3G Plans are Paltry - The basic $15 plan for 250MB data is really paltry. It didn't take long to exceed this for very modest data use—might be good only if you do email and other text-based low-data things with the iPad 2. I'd suggest the 2GB plan. • Tethering or MiFi Might be Better - One reason to go WiFi is if you have tethering with your iPhone, a MiFi (3G to WiFi device) or just never use it outside of the home or work. • Cost Benefits to WiFi - Also, for a bit over the cost of the 16GB 3G iPad 2 ($630) you could get a 32GB WiFi iPad ($599) and a regular Smart Cover ($39) for $640. Having that extra space might be more important to you than 3G. For us, the 3G device was a great choice. We wanted data access specifically for road trips, for mapping, surfing, video and other data uses on the road. On our big family trip last summer, we made extensive use of the Google Map feature in the iPad, which is aided by the GPS unit only found in the 3G iPad. Having 3G on the road was also very helpful for finding hotels on the road—my wife was able to check the web for hotels nearby, call and get availability and then route us to the hotel using the large iPad screen. As a general road trip device, the iPad was fantastic. Long battery life, access to game apps and videos for our 8 year old son was perfect to keep his attention for our 10 hour trip east and back. Especially key was battery life—10 hours made it easy to let us run the iPad without any concern about the thing going dead on us. I hope these observations are helpful if you're pondering an iPad 2 purchase. If you have other observations to add, please leave a comment so this article can become a resource for others.